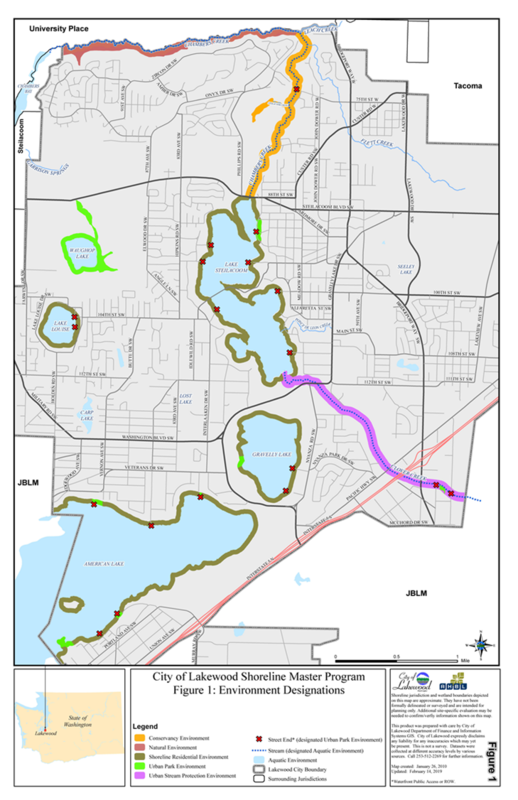 Lakewood’s current Shoreline Master Program (SMP) was adopted in 2014. You can view the draft 2019 amendments to the 2014 SMP here. You can view the draft updates to the Restoration Plan here. Public participation will be an essential component in the review of, and possible amendments to, the SMP to guide the management of the City’s shorelines. Check the Events page to view the upcoming opportunities for public input. Within the City of Lakewood, the areas regulated under the SMP includes the shorelines of American Lake, Gravelly Lake, Lake Steilacoom, Waughop Lake, Lake Louise, Chambers Creek, Clover Creek and associated wetlands within the Lakewood City limits.